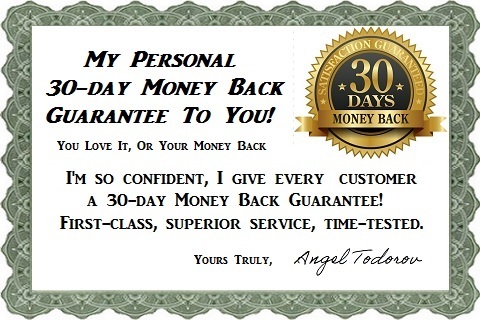 Along with a 30-Day Money Back Guarantee! Short answer: Angel is the owner and operator of ANGELINDY. Angel is 39 years young, married with one child. His working skills are refined, so you'll not find him taking breaks or talking much during the time of service. Do not expect him to be with a police record, to find him smoking, to show street manners, to be disrespectful to you, or anyone in your home. Angel believes a man's character comes from what he does when no one is looking. And even though you might not be able to be home during the time of service, he will give you the best. Because that's how he would want any person to treat him. In his mind, nothing is more valuable than earning people's trust. After all we're all in this together. Does he push or spam people to use his services? No way. Does he pay to advertise his business? Not really. He believes since humans pre-date and pre-exist the money, love (not money) is the key to the real life. There are many ways to improve (or decrease) the value of your life. Rest assured, he already made his choice! Feel free to peak around and find out Why People Choose Angel. Angel respects his clients, their time and properties. He is showing up when he says he will and he is doing what he says he will. He is truthful and honest about all matters while serving your residence. Angel is always taking responsibility for his own behavior, choices and work, and he expects the same from you. Angel is conducting business in a manner consistent with the highest ethical and moral standards. Otherwise, he believes he damages himself and his company's reputation. Angel is not perfect but he truly strives for excellence in everything he does. Never compromising quality for speed or price. He is resolving all problems, mistakes and accidents (if any) quickly to your satisfaction. Angel keeps standards of professional conduct to all aspect of his job. This includes all communication and interactions with his clients - in person, in writing and verbal, including his online presence. Angel doesn't argue with his clients. If he doesn't meet your high expectations, please let him know. He will gladly refund all your money back with no questions asked!